Below is a selection of links to complementary therapists and other healthcare suppliers, which I hope you find useful. If you would like to suggest a link to add to this page, please send it to me via my online contact form. Chinese Medicine Times. 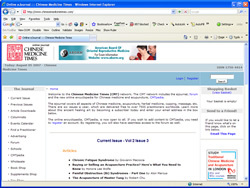 Online journal covering all aspects of Chinese medicine and acupuncture. Helen Percival is a Chartered Psychologist who established her practice in 1984. Choose Positive Change at Water Lane Clinic in Wilmslow was established by Helen in 1998. Helen leads a team of counselling therapists offering psychotherapy, life coaching, stress counselling and clinical hypnosis to help with problems such as stress and anxiety, fears and phobias, depression, lack of confidence, relationship difficulties, low self-esteem, career problems, eczema, pain management, eating disorders, migraines, insomnia, examination nerves, weight control, smoking cessation, Irritable Bowel Syndrome, panic attacks and many others. 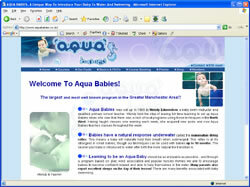 Aqua Babies was set up in 1999 by Wendy Edmondson, a baby swim instructor and qualified primary school teacher. Wendy took the step of leaving full time teaching to set up Aqua Babies when she saw that there was a lack of local programs using these techniques in the North West. Having taught classes one evening each week, she acquired new pools and now Aqua Babies teaches classes throughout the week. Aqua Babies is a unique way to introduce your baby to water and swimming. Courses are run in Didsbury, Cheadle, Timperley, Bramhall and Oldham. Julia Di Domenico qualified as a chartered physiotherapist in liverpool in 1986. She became interested in pilates after a neck problem forced her to re-think her occupation. 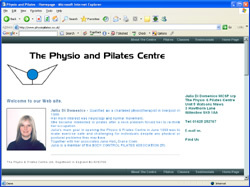 Julia's main goal in opening the Physio & Pilates Centre in June 1999 was to make exercise safe and challenging for individuals despite any physical or postural problems they may have.Together with her associates Jane Hall, Diane Cook, Julia is a member of the BODY CONTROL PILATES ASSOCIATION®. The Physio & Pilates Centre can be found in the heart of Wilmslow.